With green growth as a goal, Frederikshavn Municipality aims to be running on 100% locally produced renewable energy by the end of 2030. Over a decade ago, the City Council in Frederikshavn Municipality launched the Energy City project, aimed at tackling climate change as well as creating green growth and local jobs in the energy sector. Today, the project is well underway and likely to make the municipality self-sufficient with 100% renewable energy by 2030. By phasing out natural gas, expanding the municipal wind turbine plan as well as undertaking energy renovation and optimization of municipal and private buildings, the municipality has already managed to reduce 5.8% of its energy consumption and increase the proportion of renewable energy to over 27%. Citizen and company involvement is a key element in this green energy success story. One initiative, Energy Trail Knivholt, is both a physical and virtual showroom which informs citizens about the benefits of green energy, such as how heat pumps and household wind turbines can generate long-term savings. Simultaneously, local companies showcase and test energy solutions on the trail, which soon will be complemented by a Center for Sustainable Development in Frederikshavn. Other initiatives in the Energy City project include new public biogas buses and several charging stations for electric cars, which also reduce the municipality’s climate footprint. 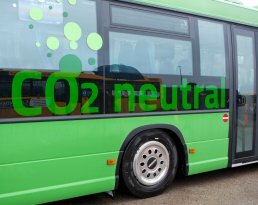 Thanks to the Energy City project, biogas buses are now in operation on the regional route from Frederikshavn to Aalborg. Development of wind farms, joint pipelines between heating plants and better use of industrial surplus heat have increased the municipality's energy efficiency and use of renewable energy. By switching to biogas-driven buses and garbage trucks and installing more charging stations for electric cars, the municipality has become more sustainable on the roads. The cooperation initiatives of the Energy City project include a city network, a network of 10 local district heating plants, a youth climate club council and close cooperation with Aalborg University. Frederikshavn municipality is the northernmost Danish municipality, located in Nordjylland.